Save and Smell? Do Cloth Diapers Make Sense in a Disposable World? We can do it, my wife and I said to each other as we studied our budget for new parents. My wife was 8 months pregnant and we had just realized the cost of daycare, formula and the dreaded diaper dollar dilemma. John and Lisa with two young daughters, had just left our home after proudly describing their experience with cloth diapers. It’s easy they said. You just rinse, soak and wash those suckers in the washer and you are good to go again. No smell, no bother. 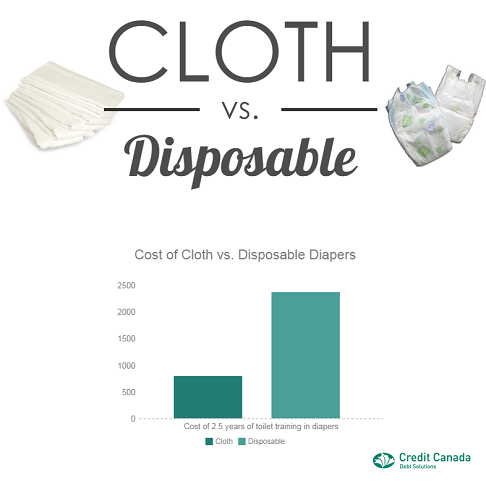 According to Mother Ease, a Canadian company promoting the use of cloth diapers, the savings of cloth can be substantial. Over the two and a half years that the typical child needs to become fully toilet trained, cloth diapers are estimated to cost $796.00 including laundry costs. By contrast, at five to six disposables per day, the typical baby will require 5,019 diapers for a cost of $2,375 or 0.37 cents per change. That is an extra cost of $1,579. Well, it’s amazing what a year and a dose of reality will bring. John and Lisa were back for a regular visit. John and I were admiring his new truck. It turns out that Lisa was stuck with the job of washing cloth diapers. Any savings were consumed with John’s truck payments. That’s just not fair, my wife said as they drove away. If you are expecting children and struggling with the costs, there are several factors you need to consider. First, planning your finances during those expensive years is very important. Credit Counsellors can be a helpful resource planning for the costs of a family and can help you create a budget for new parents. My wife and I eventually decided to use disposable diapers. We had to weigh the guilt of the cost to the environment with the fact that my wife was making so many sacrifices in order to stay home and to care for the baby. There was a dollar cost associated with our having some balance in our relationship. I know some couples successfully save money with cloth diapers. But as I have found on so many occasions since then, you have to be reasonable with your financial decisions in order to respect your partner. In many Canadian households, disposables are convenient. Keep in mind though that convenience carries cost. In our case, we chose to use disposables over the $1,579 savings associated with cloth diapers. Convenience gave us more quality family time.